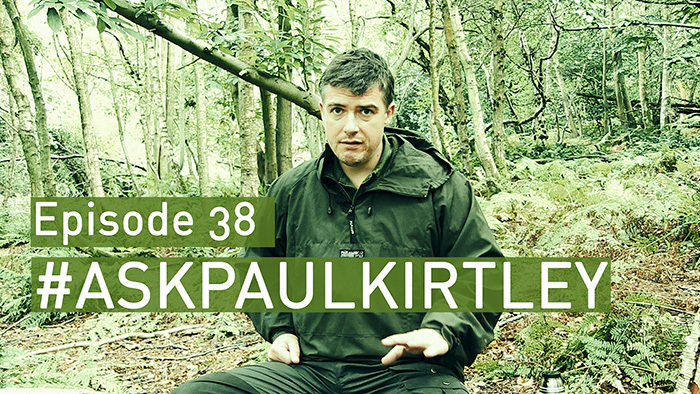 In this episode of #AskPaulKirtley I answer questions about boots for bushcraft, 3-season sleeping bag choices, carbon steel knives and flint for sparks, how to avoid shredding your knuckles while using a firesteel, long distance hiking, lightweight gear and bushcraft, how do you know when you know enough for wilderness, and what would I do in a particular wilderness canoe expedition survival scenario. Another informative video and well worth the wait , To me personally I have no problem with the length of the AskPaulKirtley videos and if you did I would watch 2 x 1 hour weekly episodes , lol ,but seriously whatever you decide ,I am eternally thankful for the time,effort and knowledge you give freely.Paul when I first began my journey and love of outdoors and wild places some 45 odd years ago I was using a canvas tarp,wool blanket,a home made rucksack with a wooden frame and mostly ex military clothing not lightweight at all ,probably what some would say was traditional , which I do like but at the end of the day can be far to heavy.My favourite enviroment is the temperate bush/woodland so even though I would love to carry/wear use the lightest products there has to be a compromise because of the lack of durability and would like to reach a happy medium so I look forward to more episodes of your Lightening the Load series.Once again Paul thank you. Thank you, thank you for the time and effort that you put into your Q & A videos, as well as the generosity with which you share your knowledge. I really appreciate them and your passion for bushcraft. Regarding your question as to the length of your videos, I would prefer two x 30 minute episode option, but having said that, just keep doing what works best for you. Warm regards (figuratively and literally!) from South Africa. With respect to the format I am just grateful that you do it all. I am more than happy with the current format. No issues with the length or the detail you go to. To me the this speaks volumes of your dedication and commitment to what you do and enjoy. This came across quite clearly upon attending your great camp craft course back in early August. Did you ever go to sleep on that course? I know you want feedback and hopefully this is some but in the end would I say do what works for you. You’ll get no complaints from me. I say keep on doing it just the way you are Paul, like you say it’s aimed at the dedicated outdoors man who whats that in depth information and those are the people who will be willing to dedicate the time. I personally can not thank you enough for putting so much information out there for free, I very much look forward to sitting down of an evening with my journal making notes on important points, Emily even joins me now from time to time and we enjoy listening together. I’m in western Canada and now retired. as such, it’s not a problem for me to watch for the full hour…..probably the limit of my attention span, anyway! Enjoying your videos very much and can put many of you examples to good use in my immediate environment. Keep up the great work. I really enjoy, listening to your podcasts! More often than not I watch the video, and I think the content you put out for free off your own back is amazing. You have a big influence on my ever growing passion for the outdoors and interaction with the natural world around me, so thank you for the inspiration! these “foot-gloves”; interestingly, the Swiss military mountain hiking boot the best! All depends on your load and terrain conditions. Keep up the great work audience. Excellent Paul. Format is most appreciated as is. You are informative. Just a thought on my end, regarding bushcraft; old Mors states, “The more you know, the less you carry.” This embodies anything in life, but to answer the question “how do we know when we know enough?”, I think this comes from experience, not only the environment you wish to explore, but how self-reliant you can be in that environment with the least amount of man-made tools. And even old Mors is still eager to learn more, which is his charm and obviously yours a well. And, with the canoe scenario, same applies. The more you know, the less you worry about what you have on you, and the more easy the experience is. Just an addendum: they say ignorance is bliss. I am 62 years old, and have enjoyed the Canadian wilderness since I was very young. I never learned to make friction fire because quite frankly I never had to. I always brought matches, or a lighter and a firesteel with wax dipped cotton balls flattened out on my person. The “Metal Match” was my first army surplus toy which I learned to use well in 1970. I also made fire with a magnifying lens. I can use flint and steel, battery and steel wool, parabolic lens, but never did friction. Go figure. Maybe I’ll try it some day, but for fun. My point is, I have always managed to make a fire anywhere, any time, rain or snow, or fair weather, because I always came prepared to make fire. I always brought sufficient food with me for my expected duration out there and supplemented my fare with fish, plants and small game in season. I also carry adequate clothing and sleeping gear, although I have huddled on a stack of boughs in front of a fire with nothing but a nylon poncho to keep me dry and I always had a container to boil water in for tea, whether Labrador tea or store bought tea from China. My point is, I have been the consummate Boy Scout and have been prepared for my experiences with basic implements and all the knowledge I can retain. I still love to add to my knowledge, but, honestly, I have done with very little equipment, and here I am, still here. I know what I know and am comfortable in the bush. That’s how I know I have enough to make it, but I never stop there. I like challenges and innovation and yes, I even tried the Rutiger Roll. Go out and have fun. This format, for me, is just fine as it is. I would not change a thing. If I don’t have the time to get through a longer episode, I press pause and come back later. I find the way you are answering the questions to be just perfect. I really do appreciate you explaining your thought process when you answer; this is much more informative than just saying what/how without explaining why. Thanks for doing this! hiking and camping after a long time away. of my youth in the woods. I’ll second that Mark – good idea, especially if one wants to return to a podcast to refresh their memory! Howdy Paul, love the current format, enjoy hearing your thought process, don’t change a thing! Always learn a lot from every episode, usually listen to them all at least twice. I was interested to hear your thoughts on footwear. I’ve stopped using footwear with built in waterproof liners, they get pretty sweaty and are unnecessary for many of the places I hike.. When I do need to keep my feet dry I use arc’teryx Mattock gore-Tex dry socks. They keep your feet, and legs dry to just below the knee, are light, and roll up smaller than a coke can. I use them for extended periods of time performing wildlife surveys in flooded forests, and in my opinion they are superb! Not cheap, but perfect for my needs! For me, the format you are using works well. When I get your email telling me of the latest…ask Paul Kirtley… I give myself a time slot for watching. Thanks for all the effort you obviously put into these vids. For me the format is good. Seeing your thought process is, for me, the most instructive. Boots, I use the Aku pilgrim GTX and love them. Although I have been thinking that my next pair will be without the gortex lining and doing the same as you are saying (gortex socs). You may well have just made my mind up for me. Thank you for these question and answer sessions. This format works well for me as I listen driving to work. I really enjoy listening to the thinking behind the answers, as it really helps with my decision making and problem solving. There are so many techniques and kit that is the latest must have, and it is so refreshing to hear an honest experience based approach. In answer to your question, whatever is easiest and most sustainable way of delivering the content. Great informative video as usual. As for the length of the videos a 1 hour video with 6 questions is good for me. If I don’t have enough time to view the full video I just take a note of where I finished viewing and pick it up from there. Not an issue for me at all. As for the lightening the load type videos I would definitely like to see more of them. My back and knees will be for ever great full. Thanks as always for your outstanding work, Paul. I have to say you introduced me to a totally different way of interacting with Nature. I have been an avid mountanieer for ten years and was overlooking nearly everything below the treeline. I know you will keep up the great work, and let me tell you that I would prefer a one hour format. I’m so happy with how you do things now. I rarely post anything but I had to say my 2 cents worth this time. I clean houses for a living and your podcasts keep me from death by boredom! Keep up the awesome work you do. I glee so much wonderful information from you! Firstly the firm at. I’m happy with things as they are. Yes they can get a bit lengthy but I simply watch them in sections. Like many others I’m grateful that you even do this at all so to me whichever format is easiest for you works for me. Secondly, there was a question about scratches on knuckles when using the tip of the knife to make sparks with a fire steel. I saw the picture and instantly recognised the cuts as I’d done it myself not long ago. Those cuts look like the knife has slipped off the steel too the right (assuming the chap was right handed). If you are using a lot of force and this happens sometimes the knife hand can flick backwards, underneath the steel as a result of the released pressure. In that scenario it’s easy to run the blade over the knuckles of your steel hand and get those cuts. From my personal experience I realised the reason the knife was slipping was due to poor sharpening on my part. I was practicing with an old mora which was the first knife I learned to sharpen on. After inspecting the tip more closely I found that I had a tendency to lift the blade too much on one side as I was sharpening which meant the stone wasn’t in contact with the full length of the bevel. The blade was sharp but the bit of the knife I was using to spark with (the portion with the sharp 90 degree angle) was only about 5mm wide. As a result it was easy to slip off this very small face and cut myself. I would definitely look at the knife tip to see that you’re not making the same mistake as me and correct it before trying again. Cheers Jack and thanks again for your question. Hi Paul, I’m an avid fan of your podcasts and askpaulkirtley series and blogs and youtube. To be honest, I’m amazed you deliver so much quality online stuff for free! Please don’t stop (or start to charge for it!) – it’s fantastic and I love it! I’m surprised you’ve come in for criticism on your material – I have to say I think that’s a little selfish of the consumers to ask for it. It’s a late reply, but the reason has to do with the answer to your question: I download the episodes and tend to listen to them when i’m travelling. Not very convinient with comments & show notes, but combined with the podcast an excellent choice for stormy days in a tent. Therefore i reallly prefer the long & downloadable format! Sometimes the topics fit perfectly, i remember listening to the tarp/rain episode while sitting under a tarp on a rainy evening during a recent canoetrip. I really enjoy your two podcasts and it is one of the few formats that i follow on the net. With Boots we seem to have a similar taste, for me its Lundhags Polar Quest in Winter, Lowa Patrol boot most of the year (dont expect too much water resistance though) and Lundhags Syncro Boots for everything really wet. As much as i would like, travelling to the uk for a course is quite complicated for me, but i would be really interested in an intermediate/advanced wintercourse in scandinavia – learning bushcraft skills as well as wilderness travelling skills (stuff like judging snow/ice quality/overflows). A propper/profound winter course seems to be almost nonexistent in Europe. Just a thought because that is something that i am searching for. Keep up the great work and thanks for all the nspiring stuff you put out! I’m a bit late with this comment but hope it helps. The general consensus seems to be leave the format as it is, and I wouldn’t disagree with that. I admit that I sometimes fast forward over topics that are less relevant to me. I was interested in your comments about boots, as like you I have found that waterproof membranes wear out long before the rest of the boot. I have also decided that I’ll get some Sealskinz socks as the boots I have are very comfortable and I don’t want to bin them just yet. The socks are a bit pricey, but a lot cheaper than new boots. I have some Sealskinz gloves and have found them very useful and comfortable, although they are wearing out now. Roll on Christmas! Many thanks for the time and trouble you go to in order to bring us these shows, it is much appreciated. In Germany I pay 130,- € for the new pair of German Army military boots called “Kampfstiefel”. It is a high boot that becomes to warm in German summer conditions, but from september till mai they are very comfortable. They are water resistant without a membrane technique, i dont know, what they did with the leather, but it is breathable and Watertight and they become sweaty only in summer conditions. They last perhaps 3000 kilometers, if you take care about and tread them, how boots should be treated. They are constructed for infantery, motorised troops and marine. The mountaineering troops use a different pattern that is lined with goretex and stronger in the sole and more expensive, but that i never used. The normal one i highly recommend. But it is important to know, that this a product, which is not constructed to repair it. You use it untill it is finished and than throw it away. I love your ask Paul Kirtley show and consume it as videos on my mobil phone. Sometimes i have tecknical problems after perhaps 30 minutes, and do not know the reasons for that. I thing that would be perhaps a reason to keep them shorter. I also guess, that you will get over the years more and more questions per week. Perhaps it would be sensible to produce 30 minutes shows that concentrate in only one content. So you could bring them in an order like the chapters of a book. Like that perhaps: Winterboots, summerboots, socks, trousers, shorts, shirts, underwear for summer, for winter, for arctic winter, … Lenses and caps…. Cooking pots, cooking fire, how to barbeque a mammout, if you find one in sibiria, and it is still good, canibalism in frosty areas and my ethic opinion about, and so on. So if i am interested in campfire, i do not have to listen about canadian canoes or wintersleeping bags. I thing, it would be over the years better, if you collect the videos in a structure like that. Still now i am feeling a bit at your homepage like in grandmas attic. Today that is charming, but perhaps it could create in ten years a problem. I thing you will get the same questions more and more, if people do not find the given answers easily. So perhaps with shorter videos in a structure of chapters, you devellop an outstandig collection of more and more specific articles and intelligent comments on that, that becomes in the end more important than every book (like wikipedia left somehow the old dictionarys behind) instead of repeating in the end 2000 times, that a raincoat can be usefull in whet conditions. An other point which could also speak for shorter videos, could be, that younger people which aren’t english nativ speakers, perhaps get after 30 minutes real problems with the concentration. If you are speaking about dangerous things that could be critical! Imagine, you would listen to a french or norwegian teacher! But i can’t tell you that, because my english isn’t so bad. Apropos: Your english pronounciation allowes foreign people to follow your videos. That is a big difference to everything else i found about bushcraft in the internet. It really helps, that you use that excellent oxford english in combination with a choice of simple words. Please keep in mind your younger followers, who are not british! That is all i can criticise unfortunatly. So more or less, in my opinion, you should stay, how you are!